Fessel International is a consulting company specifically dedicated to the restaurant industry and to the companies and individuals for whom excellent Food Service is a critical element of their success. 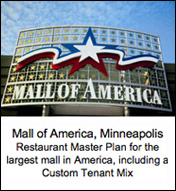 Centers, Hotels, Casinos, Theme Parks, Universities and Freestanding Restaurants, from Fast Food to Fine Dining. We focus completely on the Food and Beverage aspects of each project with which we are involved, from the feasibility and conceptual stages, through systems and design development, to project implementation and staff training. Disneyland Resort has added food and beverage staff, tapped foodie trends, and tied comestibles ever closer to "storytelling" to enhance experiences at its Anaheim campusâ€”and grow guests' per-capita food spending. "A theme park based on Korean pop culture is set to open in Goyang, Gyeonggi Province, in 2017. Called "K-Culture Valley" for the time being, it will be built on 326,393 square meters across the Korea International Exhibition and Convention Center in Goyang, featuring six differently themed zones that highlight Korean pop music, TV dramas, and movies as well as the country's history and retro culture. " Fessel International works to help restaurants and landlords find their perfect match. "As dining becomes increasingly synonymous with success for shopping centers, Fessel International works to help restaurants and landlords find their perfect match." Pacific City retail and food hub hopes to be luxury alternative to Huntington Beach's Main Street. "South Coast Plaza has Bloomingdale's. Fashion Island has Nieman Marcus. So how will Orange County's next luxury shopping center, Pacific City, compete with rivals?"